With the new Star Wars cast all set according to the Internet, and no official Lucasfilm announcements forthcoming just yet, this week was filled with Star Wars stories that will eventually lead up to those announcements—because if there’s one thing Star Wars fans love, it’s the stories that take place before the stuff they care about. And so the world began the week by talking to George Lucas’ son Jett, as these prequel adventures must always begin with the kids, who reminded us that his father had been working on the new trilogy for nearly a year, before Disney approached him about taking the franchise off his hands. He also reminded us, “I already know what happens. I’m happy with what’s going to happen,” in case you were concerned that it didn’t meet the Jett standard. (Perhaps you thought the only lonely place was on the moon? Jett! That’s no moon. Jett! etc.) Also Jett assures and/or warns that his father and J.J. Abrams are “constantly talking,” with Lucas helping to guide the film from afar, and making sure everything that has transpired has done so according to his design. Whatever the actual title (Well Lookee Here, It’s The Sith!) ends up being, film critic Ali Arikan, for one, has said he believes an official announcement—including titles and casting—is “imminent,” possibly as soon as today, most likely this month. He also said he believed a teaser would be released “featuring Luke”—a rumor Disney either proved correct or openly mocked by releasing the original 1976 teaser for the first Star Wars, which is hilarious. Great gag, Disney. Meanwhile, Jedi News UK believes Oct. 23 specifically is the day something official will actually be announced (provided Apple’s new product launch on Oct. 22 doesn’t steal all the PR), with the first teaser to then be revealed alongside Captain America: The Winter Soldier in April. Again, these are rumors of announcements and teasers, which is what we’ve all been reduced to in terms of Star Wars reporting. 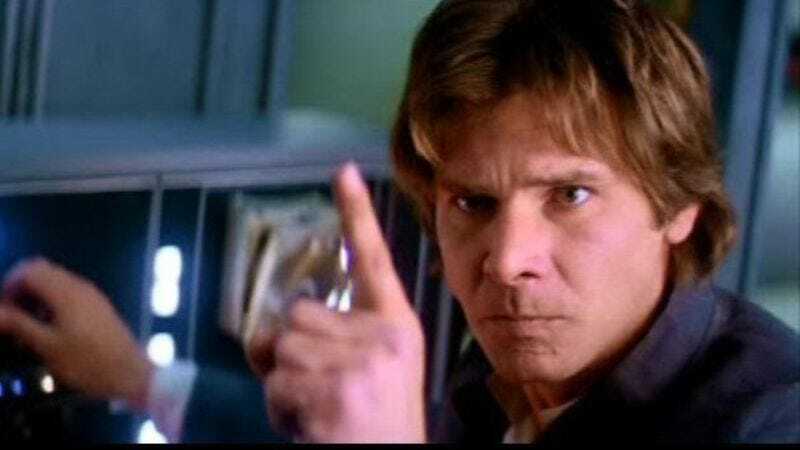 Finally, should those casting announcements drop today, tomorrow, on Oct. 23, in April, or long after we’re all dead and no longer able to taste life’s sweet unsourced speculation, it’s possible they’ll happen with or without Harrison Ford’s name in them. Ford, still being prodded along the Ender’s Game publicity trail, has grudgingly admitted to being in talks with Ridley Scott about that Blade Runner sequel, and reiterated that he’d do another Indiana Jones movie “in a New York minute,” but there’s one role that doesn’t automatically conjure up fond implanted memories or wistful Don Henley songs: He recently told Graham Norton, “I’ve not quite made the choice” to play Han Solo—either genuinely still making up his mind, or stalling so he doesn’t have to answer any more Star Wars questions that he’s just going to get asked anyway, because we’re down to dissecting rumors of teasers of announcements here.